The Legal Genealogist has a second great grandfather whose first appearance in the public records that we can locate anywhere is in the marriage books of Colorado County, Republic of Texas. His second appearance is when the Republic of Texas indicted him. I love this ancestor — he’s by far my favorite ancestor — but you have to wonder sometimes how people react, and why they react the way they do, when they discover an ancestor whose past is — shall we say — less than savory. Well, now there’s an organized effort to figure that out, in the context of Ph.D. research at the University of Sheffield, England — and the research is being done by one of our own. Aoife O Connor is not just a student — she’s an accomplished historian (her master’s thesis was about children in Ireland’s prisons), and she works at Findmypast. My PhD will explore the impact of digitisation on the study of the history of crime, drawing on the experiences of genealogists, historians, students, writers and teachers. I am particularly hoping to reach out to family historians. Family historians have appreciated the value of ‘crime records’ since before the advent of the internet to say nothing of the digitisation of crime records. However it is probably true to say that most would have sought out a criminal ancestor based on family lore. With the advent of digitisation criminal ancestors can be stumbled upon. A previously unknown episode in the history of the family can be revealed. ‘Criminal’ Ancestor: if your ancestor appeared in court (including petty sessions), was imprisoned, in a reformatory or transported. Witness, Police, Victim, Judge Ancestor: if your ancestor appears in criminal records as a witness, victim, or member of the judicial system. 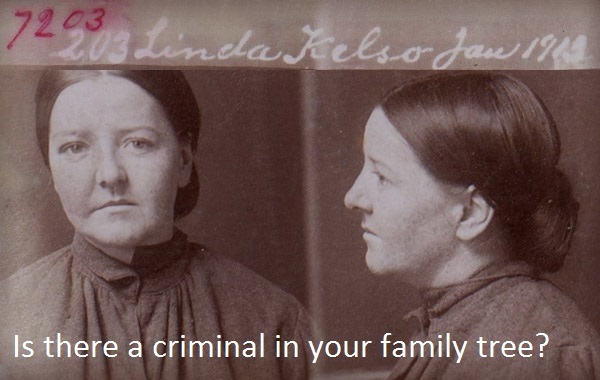 Genealogy Researcher: if you undertake research for others (paid or unpaid), and have had to tell a client about their criminal ancestor. Author/Writer: if (you) have written about historic crime in any genre: fact or fiction, magazines, blogging, academic text books etc. Independent/Academic Researcher: if (you) have researched historic crime as an independent researcher/local historian or part of your studies/academic work (school-university). Got some less-than-savory types in your family tree? Help out a fellow genealogist, and advance this research. Fill out one (or more) of these surveys, willya? I’ve got a g grandfather who led a lynch mob in 1889 (the only known case of Norwegian Americans lynching another Norwegian American) and was sentenced to life in prison at hard labor, plus three days a year in solitary confinement. He was later pardoned. I sort of stumbled across this online. Someone was helping me with his wife’s records back in Norway, and she commented that every time she Googled her g grandfather’s name, it came up in conjunction with my g grandfather’s name. Didn’t take me long to discover why! I was fascinated. When I asked my mother, with some trepidation, she was amused. She knew about it, because a cousin of hers had found an article about it in the 1970s and passed it around. Rather than it becoming family lore, my mother thinks the family actively suppressed the story. I’ve researched as much as I can, and wrote an historical fiction piece about it. I’ll certainly fill out the survey. You sure she wants American criminals? The survey seems oriented towards UK / Ireland / Australia. I filled it out anyway. Thanks for letting us know about this fascinating study! She wants all of us with criminal ancestors, no matter where we live!